New Faculty Majority publishes an electronic newsletter. We are working hard to get on a schedule so that the publication of the newsletter is more reasonably assured than our employment next term. 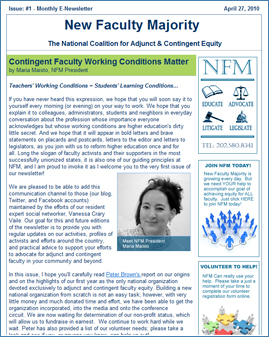 If you have not already done so, please join New Faculty Majority in order to be added to our newsletter distribution list. We respect that you are busy as we are, and we promise not to pester you with daily e-mail. It is critically important, however, that we keep our membership apprised of our progress as we work to affect positive change in higher education.